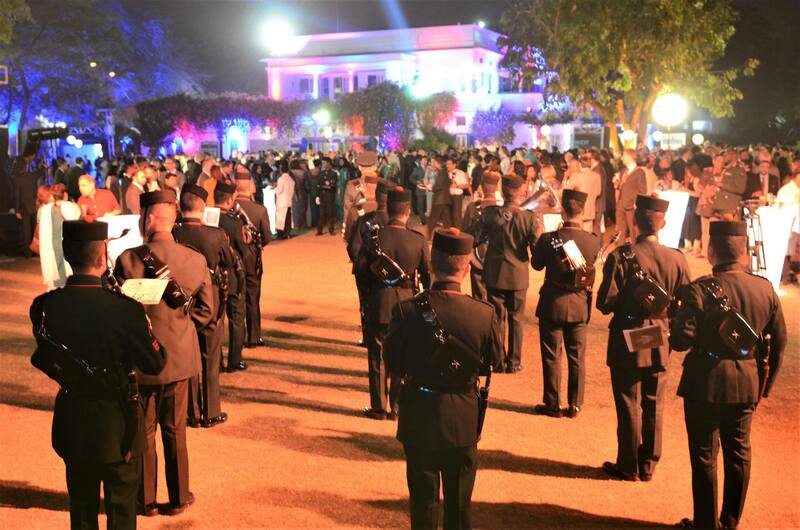 On 8th April 2017, members of the Brigade Band flew to India to provide musical support for the Queen’s Birthday Party celebrations held by the High Commission in New Delhi. 20 members of the Band who were led by the Director of Music (DOM), Major Tony Adams, were also accompanied by Officer Commanding Brigade Training Team, Lieutenant Will Reeve, 2 RGR Training Officer Captain Badri Rai and Corporal James Muir, a bagpiper from the Black Watch. 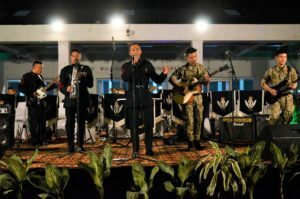 Following a concert for the Gurkha Welfare Trust in Hunstanton on the 7th April, the band returned and linked up with Captain Badri and Lieutenant Will before quickly packing their instruments and uniforms and moving to Heathrow airport. Passing through customs is always interesting when you are transporting 3 swords, 16 khukuris and lots of metal disguised as musical instruments, but it became quite funny as the search officials rather confusedly examined the X-ray of Corporal Muir’s luggage as he joined us from Edinburgh with his bagpipes! The overnight flight was uneventful and with the time zone change, we arrived in Delhi on the following afternoon. We dropped off the kit at the High Commission complex before taking over our accommodation at the Taj Maising Hotel. This also proved to be a hurried affair as the DOM and Band Sergeant Major (BSM) (WO2 Yam) immediately undertook a recce of the Defence Attache’s residence for a Dinner Night that evening. Brigadier Mark Goldsack was to host high ranking attendance from various nations, including the USA and India, and he was delighted to hear that the brass quintet was also able to accompany the Khukuri Dance as the evening was dedicated to the Khukuri! Monday was a chance for most of the band to catch up on sleep and then find everything on their wives’ shopping lists in town (how many saris, khurtas and lehengas can we get into our return luggage!). Not for the DOM and BSM, however, as recces to the famous Gymkhana Club for a concert on Tuesday and the High Commissioner’s residence for the Queen’s Birthday Party on Wednesday had to be completed first! On Tuesday morning, the hired in PA and electrical equipment was scheduled to arrive for a 1100-1500 rehearsal (the only possible time) but only half the kit arrived. Thankfully the piper was excellent and his part of the rehearsal was over in double quick time, which meant we could move directly to the Gymkhana Club and pray that the remaining kit arrived in time. It did, along with a completely unexpected sound crew who were quick and adaptable, and we were then ready for the concert. Major (Retired) Karun (Kinny) Khanna, a former Indian Army Officer and now chief ‘mover and shaker’ for the Gymkhana Club introduced us and we began. What really surprised the audience was that the first 2 were Bollywood favourites Roop tera mastana and O mere, both in Hindi! They followed this up with the Gurkha favourite Jham Jham pareli and then Syndicate. The band wasn’t finished there, however, and WO2 “Kenny G” Bhojendra played a soprano sax solo before Cpl Muir joined us for Highland Cathedral. The finale sequence featured Cpl Manikumar Rai with What a wonderful world and the Michael Buble number, Cry me a river. The band was then presented with the traditional Indian gift of a case of Rum and a personal request to play Amazing Grace, which we did, combining vocals, bagpipes and the full band. What a night! Wednesday was no less busy as we went to the High Commissioner’s residence to plan the entertainment for over a thousand guests within the gardens. Captain Badri and Lieutenant Will met the guests along with a selection of bagpipe tunes whilst the Hill Boys played folk music on the stage erected at the far end of the garden. 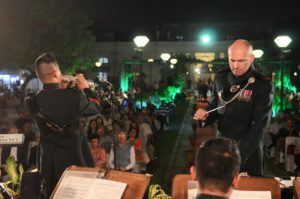 To announce the arrival of the principal guests the band performed a flashmob to Jai Ho, which culminated in the band marching from the residence to the stage, followed by the VIPs for welcoming speeches. The band then performed for another 45 minutes before signalling the end of proceedings with High on a Hill. The band performed superbly and took great pride in representing not only the Brigade, but the British Army in what was a highly successful and productive series of events. We were wonderfully hosted during our and the links we have forged give hope to the possibility of follow-up events in the future.